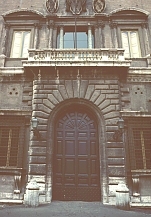 Images of the Palazzo Farnese, Rome, Italy. Digital Imaging Project: Art historical images of European and North American architecture and sculpture from classical Greek to Post-modern. Scanned from slides taken on site by Mary Ann Sullivan, Bluffton College. Begun initially as a palace for Cardinal Alessandro Farnese (or more specifically for his illegitimate son), the plan was enlarged and changed once the Cardinal became Pope Paul III. Antonio da Sangalla the Younger died in 1546 before the palace was completed so Michelangelo was brought in as architect late in the project. The three-story palace is enormous--185 feet with 13 bays and nearly 100 feet tall. 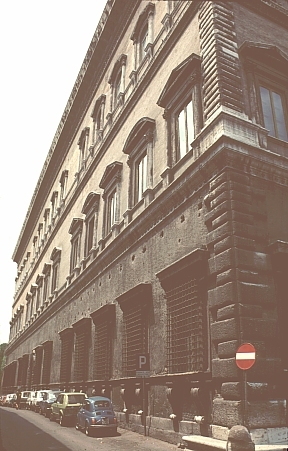 Like many Florentine palazzi, it is a square free-standing block with a central courtyard. It lacks textural emphasis in the masonry, however, using rustication only in the quoins and archway of the entrance. Each register is clearly demarcated. 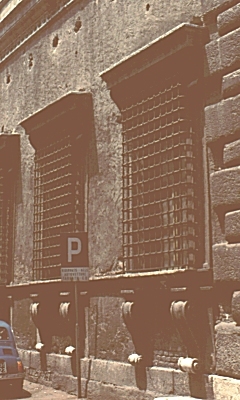 The bottom register uses "kneeling" windows, a type invented by Michelangelo. 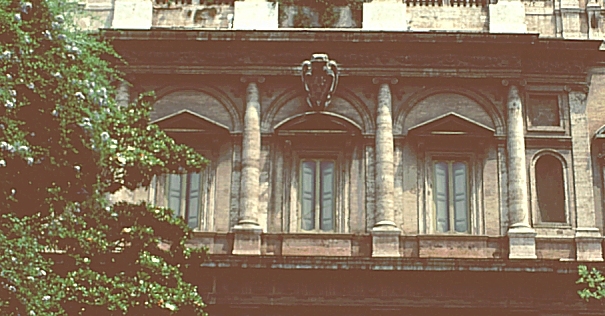 The piano nobile has "tabernacle" windows or strongly projecting aedicula windows with columns on each side with Corinthian capitals. 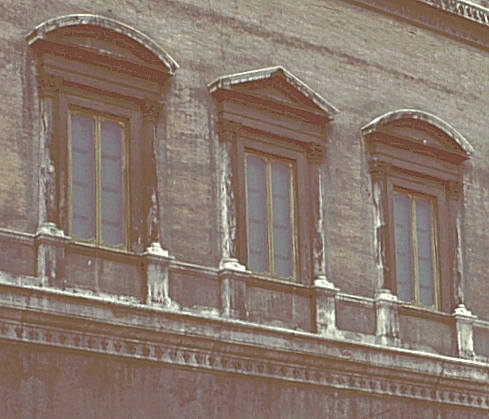 Arched and triangular pediments alternate in the second register. 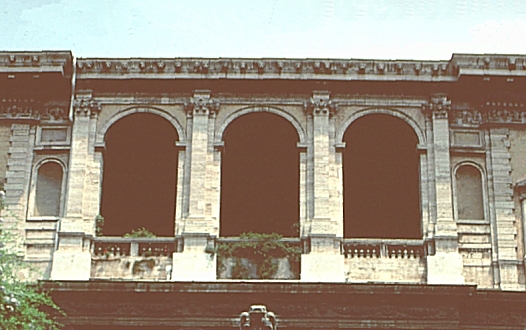 The third story has arched windows, all with triangular pediments. 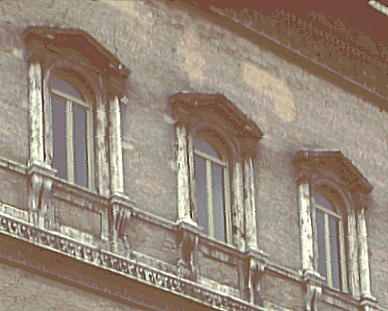 The large, strongly projecting cornice was added by Michelangelo. 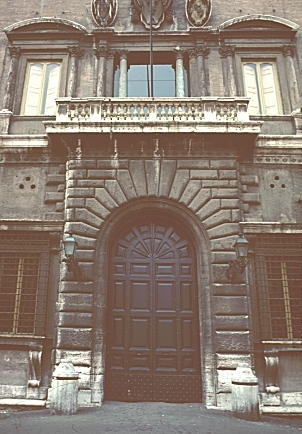 Michelangelo redesigned the entrance. 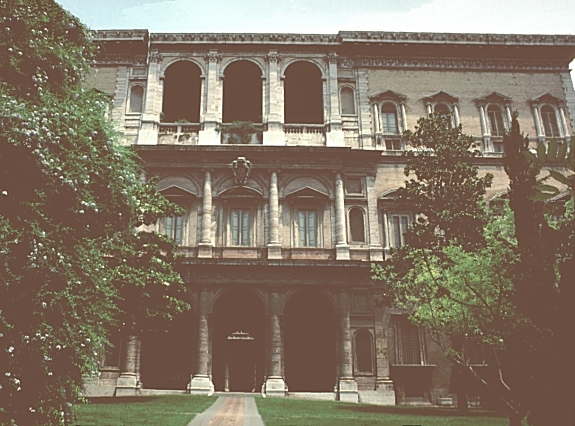 He removed the pediment in the central bay on the piano nobile and added additional flanking columns and pilasters. 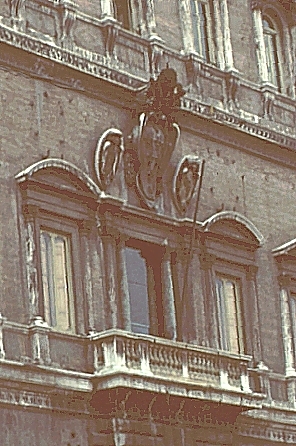 The Farnese coat of arms is displayed on three grand cartouches.